Glute activation band walks are one of my go-to drills for people who struggle to keep their knees over their feet when lifting or running. This video shows how to do glute activation band walks with just a physio band at home. This version, sometimes called ‘monster walks’ can be done with a thicker resistance band. The band is doubled up and goes around the knees. The body position and the way you take the steps are exactly the same. Why are glute activation band walks important? Some people have knees that drop inwards when squatting, deadlifting, running or doing any leg exercise in general. This can cause knee pain and increase the risk of injury. 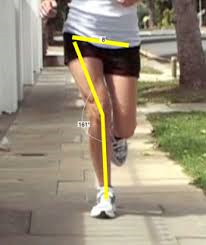 To say nothing of the loss of power that is experienced by the leg not being able to transfer force as effectively. Although it looks like the problem is at the knee, the issue is often with the hip – and specifically the glute muscle group. One of the tasks of the glutes is to externally rotate the thigh – in other words, to turn the knees out. If you have weak or inhibited glutes, you’ll find it hard to turn your knees out when lifting or landing (as in running). It is quite common for the glutes to be inhibited or a bit ‘lazy’. They don’t kick in when we want them too – for example, when doing a heavy deadlift! I’ve found that doing exercises such as glute activation band walks wake the glutes up! This results in the lifter being able to maintain better form in the training session. I also recommend this as a warm up exercise for runners whose knees drop in or experience knee pain when running. You will need to do this consistently over a period of a couple of weeks to really get the benefits, but you may feel a small change even the first time you try it. You’ll know you are getting glute activation band walks right if your glutes (muscles around your bum and hip) are burning by the end! If you feel the exercise more in your lower back, this means that your form is off. You need to arch your lower back and stick your bum out, to put the weight into your glutes rather than your lower back muscles. What results can I expect from doing glute activation band walks? Here is a video of one of my personal training clients. The video clip on the left is the ‘before’ clip and the video on the right is the ‘after’ clip. You can see that in the before clip, she has a pronounced upwards hip movement on the right hand side. In the after clip, this has almost disappeared. Glute activation band walks were part of the work we did to eliminate this issue, along with glute strengthening and ankle mobility.